Ladies machine washable floral viscose blouse. Sizes 8-24. 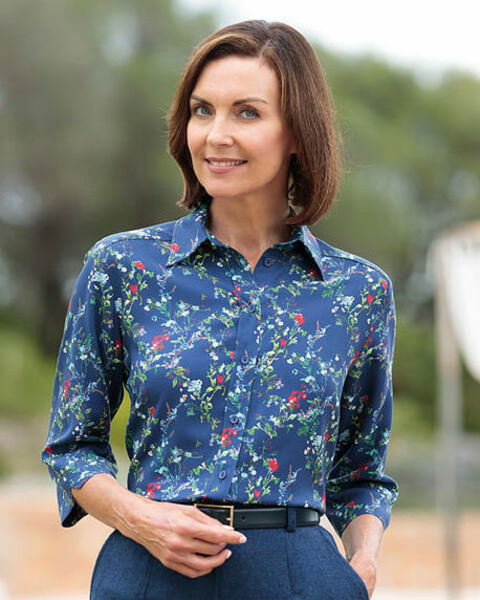 Ladies three quarter sleeved style blouse designed to cover the elbows finished with a ‘V’ cut to the sleeve hems. straight hem with side vents to be easily worn outside or tucked in. Supersoft viscose with exceptional drape. Vibrant floral design with tones of red spice, pale blue and cedar on a sapphire base. Coordinate with any of our collection of skirts and trouser to achieve a stylish look.